Kingfishers are mesmerising little birds, and usually only seen flying past, or away, at break neck speed. Our local wildlife centre here in Cilgerran in west Wales, has a healthy population of kingfishers and we’re lucky enough to see them quite regularly there. The vivid colour of out UK Kingfishers are truly stunning, a turquoise iridescence back and head, and a bright orange and underside. 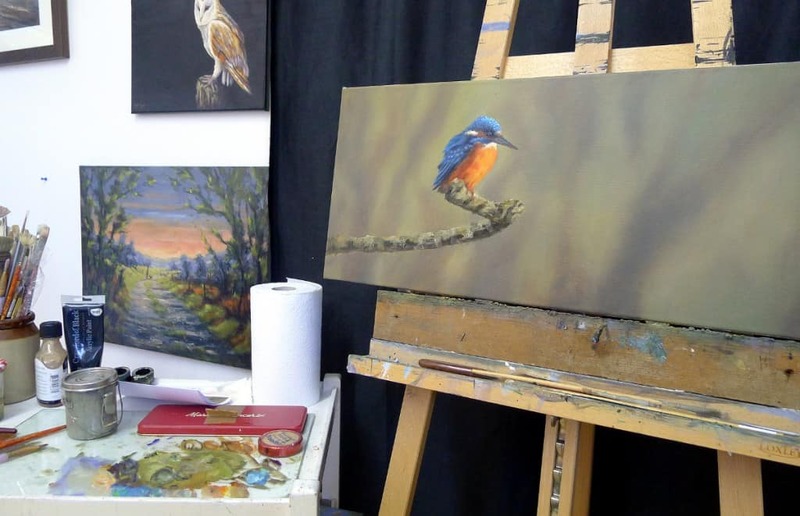 I have painted kingfisher before, just once, so this second kingfisher painting will be a exciting challenge. See below the stages as the oil painting progresses from start to finish – start date is/was 25th June 2016. Using a palette knife I’ve blocked in the background with a mixture of RAW SIENNA, ULTRA MARINE BLUE, LEMON YELLOW, and BURNT SIENNA. I’ve painted this very loosely, and not over fussed it, at this stage it’s just a matter of getting paint on the canvas in roughly the right colour. For the next stage of this kingfisher painting I’ve added some more paint and softened the background with a fan brush, blending all the hard edges go give a slightly out of focus look. 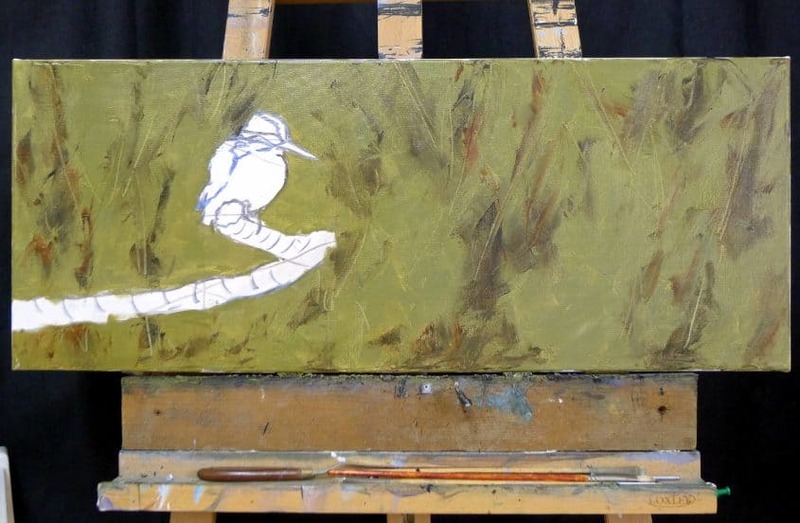 Then I’ve started to map out the kingfisher over the top, just trying to get the main colours in roughly the right place, so that I can use these as a gauge to correct the tones and colours later as the painting progresses. I’ve started to add more detail to the kingfisher and the branch now. Putting paint on the branch with a palette knife allows me to create texture and well as add colour, which helps give the illusion of wood. I’m using brushes to add paint to the Kingfisher, painting over what I already had, I’m gradually building up the depth and detail, whilst all the time correcting and adjusting what was already there. 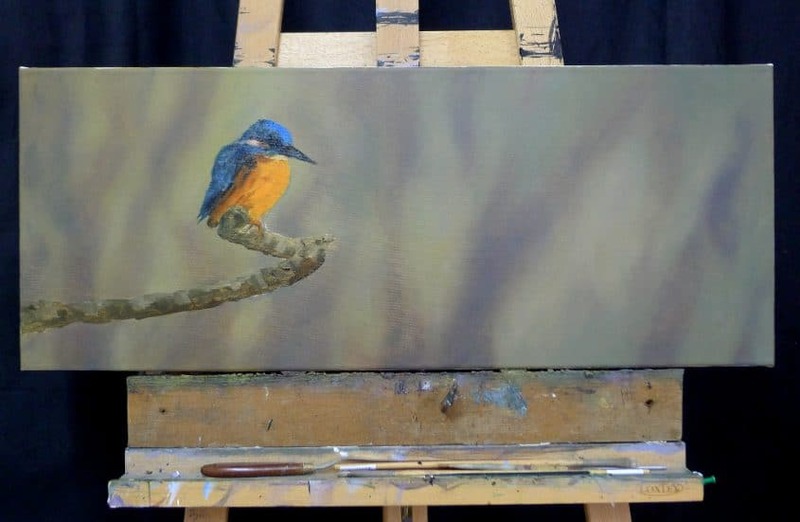 Finished painting – Here is the fishing Kingfisher painting, after a little more work from the stage above the final stage was to add a coat of retouching varnish to the painting. This helps brighten up the colour and get rid of any uneven sheen a finished oil painting can sometimes have. 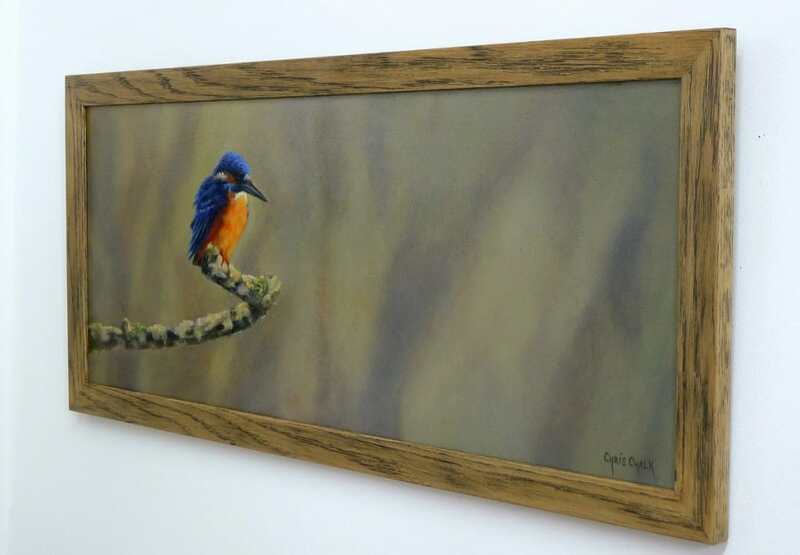 This Kingfisher painting in now available at the Cilgerran Wildlife Centre, displayed in the Visitors centre. Prints will be available to buy on this website soon. If you have any questions about this painting or any other queries please get in touch. How do you get the background from Stage 1 to Stage 2 ? How do you achieve that blurred effect ? Whilst the paint is still wet, use a fan brush to soften the edges. Brush up, down, left, right… in all directions so as not to create any lines. You want to blend the edges so that there are non. You can only do this with fairly thick, still wet paint.